Have you ever wondered what is really going on in the minds of the highest income earners and leaders in Network Marketing? What is it that they think and do differently than most distributors who are struggling or feeling frustrated or procrastinating or even burnt out? Everyone reading this has experienced some success - a win here, a win there. Whether it’s when we recruit someone new into our team or get a promotion and move up to the next level of the compensation plan in our business - we celebrate! But it's what happens when the going gets tough and the inevitable obstacles come our way. When we experience the rejection and friends of ours suddenly become the naysayers. When our confidence takes a hit. It’s on those days when you don't feel like picking up the phone and making another call. How do you overcome this? 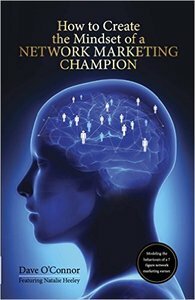 Over the last 12 years Dave O’Connor has trained thousands of Network Marketers to upgrade their mindset so they can achieve the success they desire and deserve in MLM. Dave specialises in helping people keep their head in the game, to overcome the mindset issues which have a terrible knack of standing in our path to glory and set about creating the right attitude, psyche and routines to overcome all the obstacles that can block us, and instead put us on the road to victory. In this book Dave focuses on modeling the mindset of one of his most successful students, 7 figure earner, Natalie Heeley. If you've been procrastinating on taking the actions that you know you should be taking. In other words, you know what to do, you’re just not doing what you know. If you want to build positive habits and overcome your fears of selling, rejection, success, failure or what others think. If you want to attract a higher calibre of person into your team - those go-getters who have a strong work ethic, who aren’t afraid of a challenge and are fun to work with. If you're frustrated at your lack of progress, playing smaller than you want to. If you want to develop the existing people in your team and grow them into leaders. Or perhaps your business has plateau’d and you’re determined to get to that next level. If it's any of these things then you've simply got to get this book. Scroll up and click ‘buy now’ to start reading. "This book is a great opportunity for anyone looking to succeed in Network Marketing to learn from both the teacher, and his extremely successful student." "Working with Dave over the past 4 years has totally transformed my business and more importantly the way I view myself and life. This book will help you find whatever success you are looking for." "I couldn't put this book down, it's FAB. I will be buying this book for many of my team over the next few months and giving it out as raffle prizes, every networker needs this book in their life. I am now planning to use it for a new bootcamp for my team. Will be sharing the daily exercises and we'll be doing it together, can't wait thank you!" Dave O'Connor is an international speaker and success coach. His mission it to help as many people as possible to reach their full potential. He is a Mindset Mentor to many top players in Network Marketing as well as to business leaders and company CEO's. Natalie Heeley has risen to become number one in the UK in her chosen Network. For seven years Dave has been her Mindset Mentor. With his help she has overcome her self-limiting beliefs and defeated the fears that were holding her back. Using Natalie as example and an inspiration, this book will take you through Dave's twenty-one-step plan that will allow you to create the Mindset of a Champion. Read it, commit to it and take control of your mind and your future.